Whether you serve as a vocalist, instrumentalist, technician, dancer, actor, or in some other role, you know what a blessing it is to serve on your church's worship team. But you also know that some days you're more technically prepared than you are spiritually prepared for the ministry of leading others in worship. In the midst of rehearsals, setup, and myriad distractions, not to mention the busyness of daily life, it's easy to miss the forest for the trees. How can you and your fellow team members be prepared to worship in spirit and truth as well as lead others in worship with integrity? With thirty years of experience in worship leading, Rory Noland knows the issues---in both the private life of the worship team member and the public ministry of a worship team. In this readable book, he offers practical insights on how to * Grow as a private worshiper * Encounter the character of God during worship * Respond to the character of God during worship * Be transformed by the character of God * Learn from ancient worship leaders ... and more. 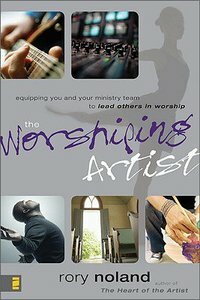 So relevant you'll think the author was eavesdropping on your last church service, The Worshiping Artist is ideal to read either by yourself or as a team.